Stamm is a very powerful VIP Level Mod with a lot of features! 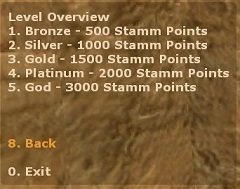 Stamm is a very powerful VIP plugin for CSS, TF2, CS:GO and DOD:S.
When players have enough points, they reach different levels with different extra features. Stamm is not supported currently. This is because it is a huge project and i can't handle it alone currently. If you want to help i would be really thankful if you make a pull request on github! Please post here in english, not in german! With Stamm players gain points with rounds and/or kills and/or playtime. When they reached a certain point limit they rise up to the next level and achieve features. The levels are specified by you, you can set up to 100 different levels. Stamm is available in english and german, but you can change the language files to your own language (You can also post them here and i will integrate the files). I provide a lot of features with Stamm (For a overview over all features see below). Also it is possible to run stamm with a MySQL database, so you can save the points online or to run all your servers with one database. You can script your own features, therefore Stamm has a really powerful API. When you have questions or found mistakes, ask me, i look forward to each new feature! There are 10 Commands to use with the console, so you can set the players points, load or unload features or start/stop the Happy Hour. Here you can see a overview over all Commands. When you save your points with MySQL you can use my Stamm Webinterface. 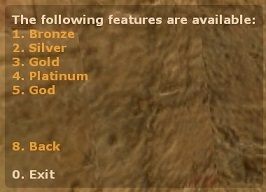 There you can see the rank, points, level and more information about the players on your server. Also you can setup PayPal payments, so your players can buy stamm points. First of all: It's not so easy to setup Stamm, but i tried my best to make it as simple as possible. There is a huge Wiki for you about how Stamm works and how to install it. Start here and work through the Wiki. Here you find a complete list of what have changed with the features. Here you find a complete list of what have changed with Stamm. Don't say Stamm isn't working! Post your problem and your logs to this thread! VIP Models: Alternativ VIP Models! Last edited by dordnung; 05-25-2018 at 18:45.
pretty massive effort mate, GJ. Last edited by sinblaster; 11-02-2010 at 00:47. Will this work on other games like Day of Defeat Source too? I know it runs on TF2. But if it works on other games I do not know. Last edited by dordnung; 11-04-2010 at 13:00. Save stats directly to what Pop? Ok thanks. Im still yet to set it up, there are some sql changes in your directions I might need someone to organize for me my end as I am not versed on doing that stuff.